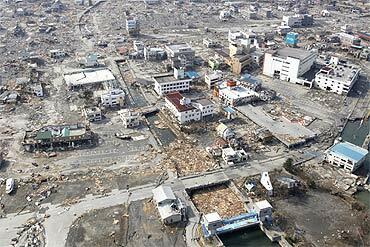 Rediff.com brings you some unforgettable images from the devastated regions of Japan. 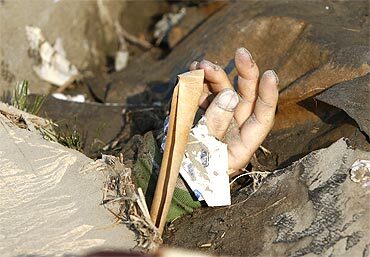 A victim's hand sticks out among the rubble after a earthquake and tsunami struck Rikuzentakata in northern Japan. 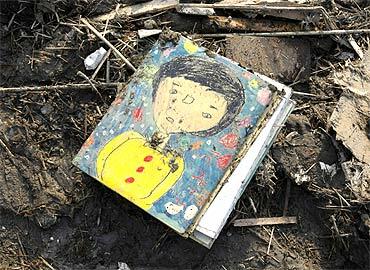 A child's book is seen in the rubble in Rikuzentakata, northern Japan after the earthquake and tsunami struck the area. 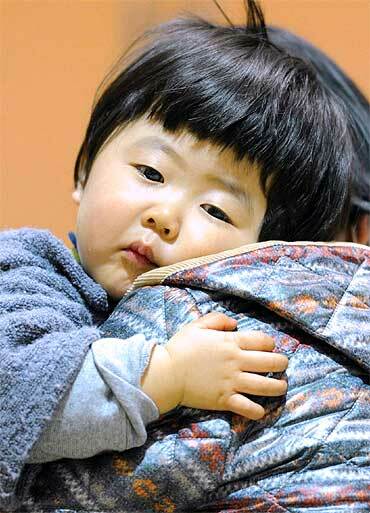 A child who was evacuated from the vicinity of Tokyo Electric Power Co's Fukushima Daiichi Nuclear Plant is pictured in Kawamata, Fukushima Prefecture, northern Japan. 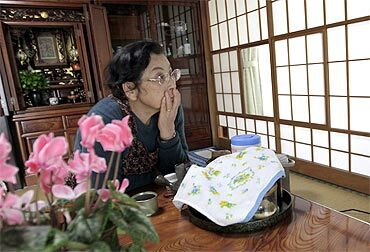 A family member evacuated from the vicinity of Fukushima nuclear power plant tries to talk to a girl who was isolated for signs of radiation outside a makeshift isolation facility in Nihonmatsu, northern Japan. 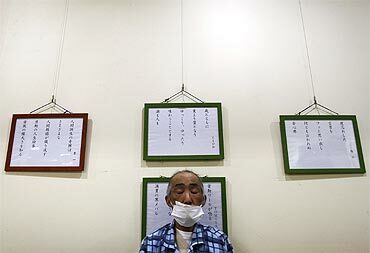 An elderly man rests at a Japanese Red Cross hospital after being evacuated from the area hit by tsunami in Ishinomaki. 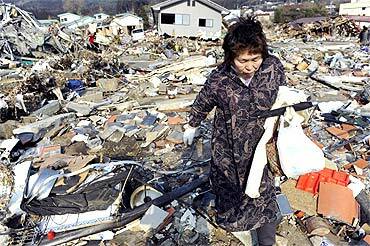 A woman searches for supplies amid piles of debris in Ofunato City, Iwate Prefecture in northern Japan. 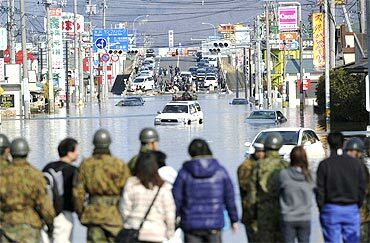 A street is flooded after an earthquake and tsunami struck Ishimaki City, Miyagi Prefecture in northern Japan. 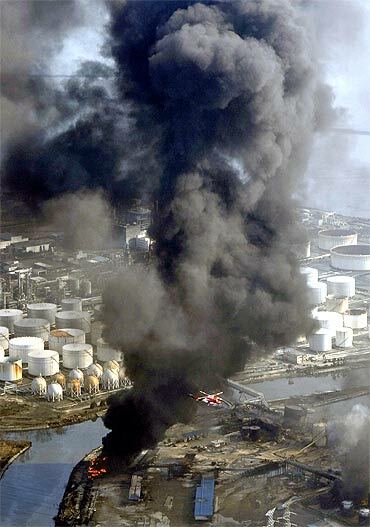 A factory facility burns after an earthquake and tsunami struck the area in Sendai in northern Japan. 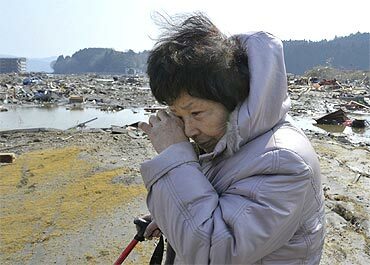 A woman searches for her missing husband amid debris after an earthquake and tsunami struck Minamisanriku, Miyagi Prefecture in northern Japan. 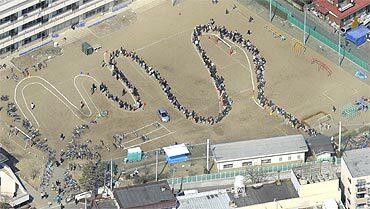 An aerial view of a line of people waiting for water on school grounds after a earthquake hit Sendai City, Miyagi Prefecture in northern Japan. Buildings are devastated after a earthquake and tsunami struck Ofunato, Iwate Prefecture in northern Japan. How secure are OUR nuclear power plants?